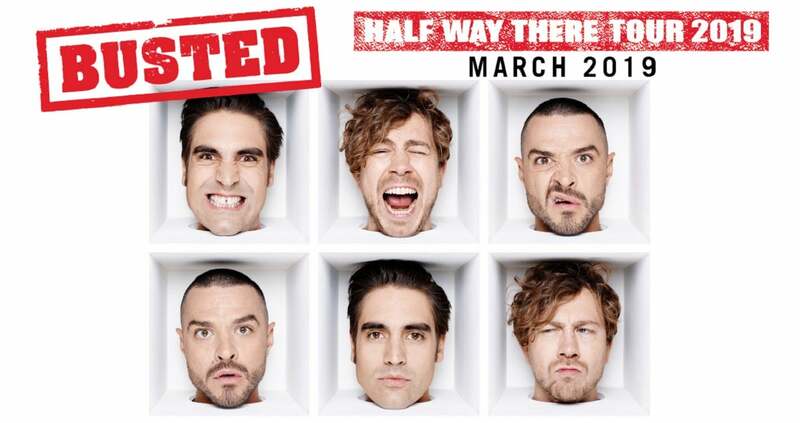 Busted have grown-up without growing old with their fourth album ‘Half Way There’ which will be released on February 8th. It finds the band returning to their hyperactive pop-punk sound for the first time since 2003’s all-conquering, multi-Platinum album ‘A Present For Everyone’. The announcement comes after Busted announced the smallest show of their career this morning. They’ll play the 100 Club on Monday and the show sold-out within 2 minutes. In addition, the band are also excited to confirm details of a major UK arena tour for March 2019. They spent a year working on the album. They wrote more material than ever, much of it at Bourne’s apartment in North London where they spent so much time together back when they first started the band. They constantly revisited each idea to make the album as strong as it could possibly be, and also had the opportunity to work with their dream producer Gil Norton, the man behind classic albums from Foo Fighters and Pixies. The result is an album that expands upon Busted’s trajectory the first time around. It’s a rush of melody and effervescent riffs as they blend huge arena-filling choruses with the classic pop-punk sound of Blink 182 and New Found Glory. Lyrically it’s often reflective and nostalgic (‘Reunion’, ‘All My Friends’ and a mini Busted autobiography in the shape of ‘It Happens’), but there are some fantastical flights of fancy too in the shape of ‘Shipwrecked In Atlantis’ and a tribute to Elon Musk in ‘Race To Mars’. ‘Nineties’ is one of the tracks which will claim a place alongside other Busted favourites such as ‘Year 3000’ and ‘Crashed The Wedding’. Opening in low-key fashion, the track erupts into life by taking us back to the era of Smashing Pumpkins and Macaulay Culkin and the carefree “days of ditching school to watch The Goonies.” The track features a co-writing credit for their old friend Dougie Poynter of McFly. “If I was a Busted fan, I’d listen to this record and feel like I got my band back,” agrees Bourne. ‘Half Way There’ is Busted’s fourth album and their second after returning with ‘Night Driver’ in 2016. The title is a play on the reference in their huge hit ‘Year 3000’ to the band releasing their seventh album. Now they’re halfway to achieving precisely that, and far ahead of schedule.